Yesterday marked the end of my stretch of Mr. Mom time and, sadly, I had to return to work. All three days were rainy but the last two days I managed to get out of the house to take the guys for a quick walk. Yesterday Martin was an angel who didn't cry at all except for when I took him into La Pain Quotidien. Apparently he shares his father's level of enthusiasm for this particular chain. After a quick walk I was able to shuffle them into the car and off to pick up another odd mid-week farm share pick up. 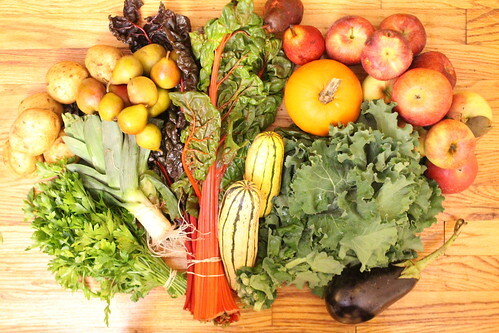 This week we got Siberian kale, Delicata squash, leeks, Bright Lights Swiss Chard, potatoes, pumpkin, parsley, eggplant, Jona Gold apples, Empire apples, and Seckle Pears. 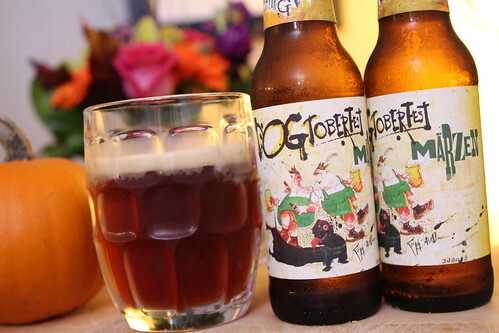 After Jen got home from work we enjoyed the last in this year's Oktoberfest beer selection: this Dogtobergest from Flying Dog Brewery. We've only had a few Oktoberfest beers this year but each of them has been excellent. It's not always my favorite style but I think the Oktoberfest beers we've had this year may be turning me around on this subject. Like anything else I guess there are so many poor versions of this beer on the market that they obscure what is, on the surface, a very enjoyable type of beer. 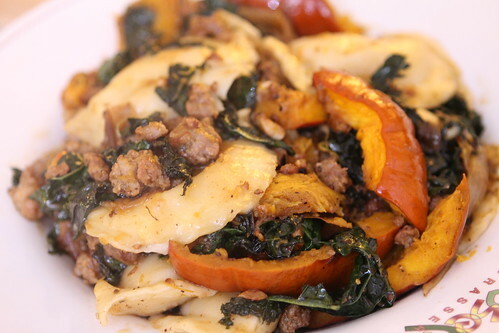 To go along with the Oktoberfest theme I made this roasted pumpkin with sausage, sage, onion, garlic, and tossed in some fresh potato and cheese pierogies. Unfortunately I did not have time to try my new brilliant idea for an Oktoberfest-themed stuffed pumpkin. Unfortunately that will have to wait until next year. Cliffhanger! Is it still a cliffhanger if no one actually cares? 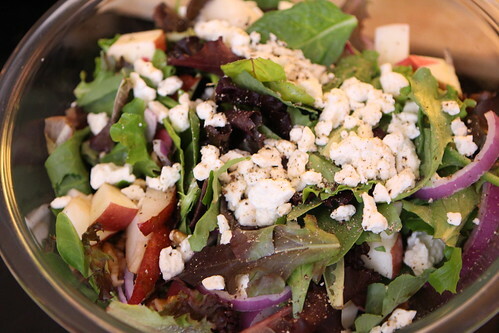 Tonight Jen made a wonderful salad with apple, pear, feta, red onion, and walnuts. She also made a vinaigrette in a gigantic Ball jar which is one of her favorite things to do. I'm not sure exactly what was in the dressing but the whole thing was delicious. For dinner we let Mario Batali cook for us. 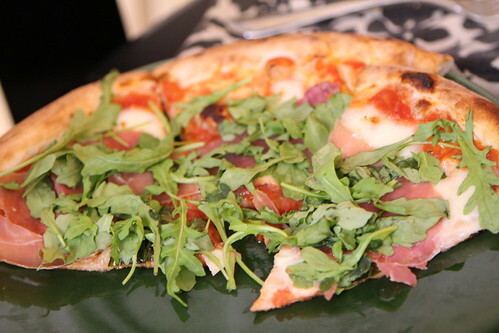 Well, we let his chefs at Tarry Lodge cook for us and had this prosciutto pizza with arugula and tagliatelle with bolognese sauce. It was so good and easy it makes me wonder why we don't have a celebrity chef's minions cook for us every night. I hadn't intended on writing a blog entry tonight. When I don't plan on blogging I usually pick myself up a nice, large beer that I have had before. 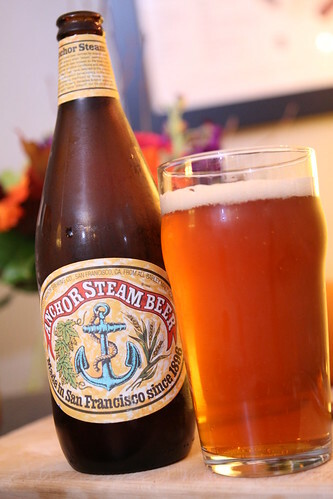 Tonight's selection was this Anchor Steam Beer which I blogged about over a year ago during my Classic Beer Weekend. It's just as good as I remember it and I will be visiting the brewery on a work-related trip next week so I am greatly looking forward to having it fresh out of the tap with whatever other beers they have to offer. If only the Wombats were joining me. After dinner things somehow degenerated into an impromptu photoshoot. We took pictures of the guys in some of the outfits they've gotten as gifts as well as on top of many of the blankets and quilts that have been crafted for them. Unfortunately we have pushed laundry off far too long and we were scraping the bottom of the barrel with finding pajamas to dress them in. These were the last two sleep outfits they had left in their drawers. After all it must have been upwards of four days since I've washed every article of clothing that they own. I don't know what I was thinking by pushing things that far. Enough talk. Time to do laundry.